This Yamaha FS1E-DX arrived in a box. This bike has received a full A1 concourse restoration, bringing her back to her former glory! Anyone born in the late 50’s, early 60’s would have either owned, or have known someone with a Yamaha FS1E. Whether Popsicle Purple, Competition Yellow or Candy Gold, one of the most expensive and sort after bikes of its time setting a-side the Fantic Chopper! Gaining leaps and bounds in quality and finish compared to the SS50 Honda and the AP by Suzuki. As the years pass by, the Yamaha FS1E has become more and more rare and fetch a lot more money than the £236 they cost new in 1975. Men and Women alike go mental to re-kindle their youth with the FS1E. 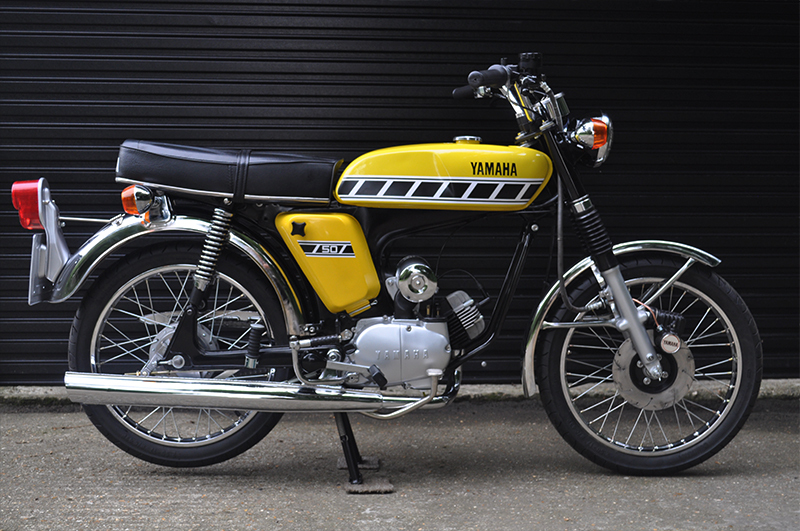 We bought our 1976 Yamaha FS1E in a box from someone who simply lost the will to live, seeing the pile of parts grow for more than 8 years, when the time came to sell up. Our FS1E represents the Kenny Roberts affiliated racing colour scheme. Our bike is the DX model – DX standing for disk brake model with the 394 UK Type engine. 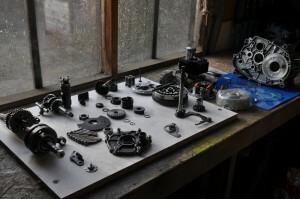 If the bike was assembled, (and not in a box), it would look similar to what we pick up for a restoration bike. Neglected, greasy parts that need to be meticulously cleaned and refurbished for we wanted to achieve – Our best restoration yet! This popular bike makes it very difficult to source the strangest of parts that are obviously covered in more than 30 years of patina and rust – and made for a great opportunity to show you what we can do with our zinc and chrome plating equipment. Main stand bolts to caliper fixings all covered with bright zinc passivate in clear blue or yellow gold, safe from rust for some time to come. Pedal mechanisms and drive shaft ends have all been finished in a durable zinc plate coating. For maximum preservation of this Japanese classic, frame and swing arm (although not original) are powder coated. Tin work repainted with original paint code 1K acrylic with custom cut FS1E Kenny Block stripes made and applied. Brand new rims and spokes were trued in house on glass blasted hubs, encasing closed wheel bearings some being OE Yamaha and for extra protection covered with the rubber seals. Contintental tyres are a real sweet spot with Lacey’s Motorcycles – having great experience in both riding, thick sidewalls/easy application and mean looking tread, When warm, the rubber turns to treacle – for anyone pushing the FS1E to its limits. Bottom end stripped and glass blasted, all bearings within the block replaced, Polished Crank, cylinder head and piston top, really show what time and enthusiasm put into making this bike perfect. Maintaining the original “FS1” barrel. Once again – just like most of our builds, almost every, if not all nuts and bolts are changed to A2 stainless hex for added class and preservation. Any one off / obsolete parts are blasted, acid etched then coated with a bright zinc plate to protect from any future contaminates. With 2 complete oil changes within the first 30 minutes of running makes sure that any last bits of gunk or dirt is flushed from the gearbox. The engine with all its bearings replaced makes for such a smooth rev and idle. 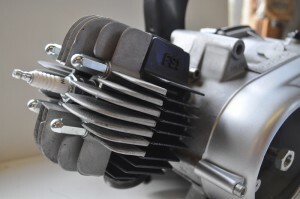 This FS1E engine has Sewing machine standards! Re-loomed electrics to brand new clutch and ignition, this bike really represents what Lacey Motorcycle’s can achieve – coming close to what the bike would have been like when it rolled off the production line back in 1976. Flywheel, points and condensers all replaced to match the effort put into the wiring loom. Having trouble with the original spark plug cap we went back to what we know and felt comfortable with: Which is the NGK cap and plug. This new ignition doesn't go unnoticed with it's 'first kick' start mentality. Maintaining many original parts that have been refurbished, items such as the Stanley headlight and rear lights, pedal mechanism and speedometer insides. The Speedometer housing has a brand new glass face, bezel and chrome housing but has 100% original insides (MPH Model). Most, if not all pattern parts are of good quality to make sure the overall finish is extremely high and as always, consumables such as bearings, brake pads/shoes, cables have all been replaced to offer the new owner an almost new machine ready for the road. Front brake has been completely overhauled, front with the adjustable lever and brand new reservoir to new copper piping and re-finished calliper. Rear brake offers brand new shoes and brake arm. Using quality OEM springs to finish her off. Visible Clevis and split pins are used throughout the bike to maintain some originality to the build, instead of today’s nylon-locking nuts, only using these where absolutely necessary (Swing arm axle etc...). We really have enjoyed building this one, making close comparisons with its competitor throughout the build, the Honda SS50, nowhere near as refined in build quality (Which is unusual for Honda). We now have our tracks set to restore the 70's Suzuki AP50 in the near future, completing the trio of nations favourites in 70's mopeds. Stay tuned with our social media sites to keep up to date with future builds. SOLD – Viewing always advised / Part Exchange Considered.